Fish wizard whispering "The Power Within!" After his ship breaks down, The Flying Dutchman takes up residence at SpongeBob's house where he proceeds to scare, startle and surprise SpongeBob around the clock. SpongeBob does get scared and goes to Squidward's house for help, but unfortunately, Squidward does not believe in ghosts. So he slams the door in SpongeBob's face. SpongeBob soon turns to Patrick to help, but Patrick just closes his door. Then he hears Gary cry for help. SpongeBob enters his house to stop The Flying Dutchman. The Flying Dutchman then says that he just wanted to pet Gary, only to reveal that it was a trick by eating him. SpongeBob despairs about the death of Gary until Gary appears behind him with no explanation. Eventually, all the spooky shenanigans grow old, and SpongeBob and all of the citizens of Bikini Bottom are no longer afraid of the Dutchman. This creates a panic for the old ghost who now fears that he has lost his scary touch. So SpongeBob decides to lend a hand and help the Flying Dutchman learn to scare people again. Unfortunately, SpongeBob's first attempt did not work until the customer on the mattress screamed from the startling notice of the mattress salesman. The second attempt also did not work since The Flying Dutchman got hit by a jump rope. The Flying Dutchman decides to give up since maybe people do not believe in ghosts anymore. This gives SpongeBob an idea. SpongeBob tells the Flying Dutchman to watch a crazy video about some mysterious saying "The Power Within" constantly. The third attempt did not work when an old lady mistakes him for someone else. The fourth attempt did not work when Larry thought that he had a flab on his pecks. The Flying Dutchman gets his revenge to go to Squidward's house and successfully scares him. The Flying Dutchman finally has the nerve to scare people again. He had a confession to make: that when his ship broke down, he lost his scare, but the ship is repaired now. The episode ends with The Flying Dutchman leaving SpongeBob with a present with a scary surprise, but SpongeBob laughs at it. He comes out of the floor in front of SpongeBob with a RAARGH! He scares SpongeBob with an evil laughter and snakes coming of his mouth. He pretended to eat Gary. He scares SpongeBob with a ARGH! He says in dark voice: Oh, don't get too comfortable. with the fire in his eyes in the background which is also on fire. He scares SpongeBob with his house coming to life roaring with the insides on fire. He replaces SpongeBob's body with tentacles. He scares him with a monster in his fridge that pops out when he opens it. To scare Squidward, he had a ghostly image of Squidward's mother asking why didn't Squidward didn't call her that melted into a giant clarinet that goes through Squidward's head that says that it heard that he doesn't believe in ghosts. The clarinet turns into a rope that The Flying Dutchman threw to Squidward's house. A multi-eyed monster ate Squidward, sending him to his living room, where a giant SpongeBob breaths heavily, pours out spiders and turns into the Flying Dutchman doing an illusion with his fingers. Giant slimy bald green monster which appears from the floor and turns into a giant ant which turns into a baby-face worm which turns into a clown-worm which turns into a creepy human face with a bubblepipe which turns into SpongeBob's head which pours out spiders which turns into the Flying Dutchman. When Squidward says, "Squiddums loves his mama. ", his teeth keep flashing between white and a pale yellow. In current airings after the premiere, this episode airs after Chimps Ahoy. Squidward's mother causes Squidward to reveal his nickname being Squiddums. It is revealed that the Flying Dutchman is or was married. The Flying Dutchman seems to want to deny it, like the real one would. It is shown that SpongeBob uses a built-in VCR on his TV just like in the episode Karate Island. Squidward is scared to call his mother. SpongeBob riding on the Dutchman's back holding his hair back is a parody of The Never Ending Story. This episode is similar to "Can You Spare a Dime? ", only SpongeBob uses a less hostile maneuver to get "Dutchy" back in shape. SpongeBob laughs at the end, but the captions say he screams. 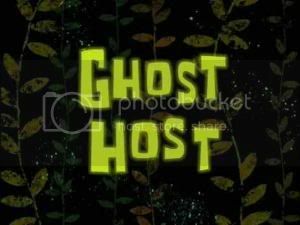 This episode first aired on YTV on October 23, 2006. When the Dutchman raided Squidward's house, the Dutchman has 5 fingers, but when he was at SpongeBob's, he had only four. The giant ant the Flying Dutchman changed into is a parody of the sci-fi film Them. The house coming to life with the insides on fire is similar to the Episode "Procrastination", except that it only roared instead of telling SpongeBob to stop wasting time. This was the #5 episode in the Best Day Ever countdown. This is the third appearance of Squidward's mom. The first was in Fools in April, the second was in Krusty Towers. At the party the Flying Dutchman threw off his wedding ring. But, when he lifts up Squidward on the rope, he can be seen wearing it. It is revealed that the Flying Dutchman can shape shift. How can Squidward show disbelief in the Flying Dutchman,especially when he has seen him multiple times throughout the series? It probably takes place before unless somehow Squidward doesn't know that the Dutchman is a ghost. In this episode Squidward's mother sounds like a old woman but in Fools in April his mother sounds like a man. If Squidward doesn't believe in ghosts, how come he got scared in the episode Pranks a Lot? This is the first time Patrick appears without a dialogue. If you look closely at the title card, you can see it glowing, so it has an animation that is very hard to see. The Flying Dutchman's ghost are similar from Casper the Friendly Ghost and The Ghost Busters. This is the second time when Spongebob's house was on fire. The title card music is the same music heard whenever the Flying Dutchman appears. This is another episode pair not to have Eugene H. Krabs.